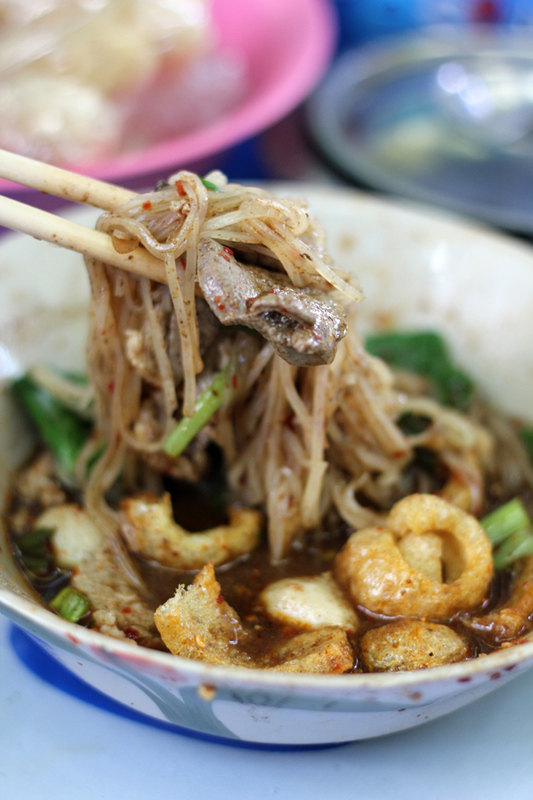 There are countless places to eat kuay teow reua (boat noodles ก๋วยเตี๋ยวเรือ) in Bangkok, and we’ve written about quite a few spots here on Eating Thai Food. But Bangkok is a huge city with everlasting culinary gems, and just a 10 minute walk from the boat noodle alley at Victory Monument is Doy Kuay Teow Reua (ต้อยก๋วยเตี๋ยวเรือ), a restaurant serving even higher quality, better tasting, boat noodles (in my opinion). As you can see from the photo above, they take their broth seriously, it’s indeed quite a notch above the boat noodles at Saphan Taksin. It’s dark, thick, rich, and each bowl already comes pretty well seasoned with chillies and spices – I barely needed to add anything extra to make it perfectly flavored. The pork and slice of liver wasn’t overcooked like it sometimes is, but it came just blanched long enough to still be moist and juicy. 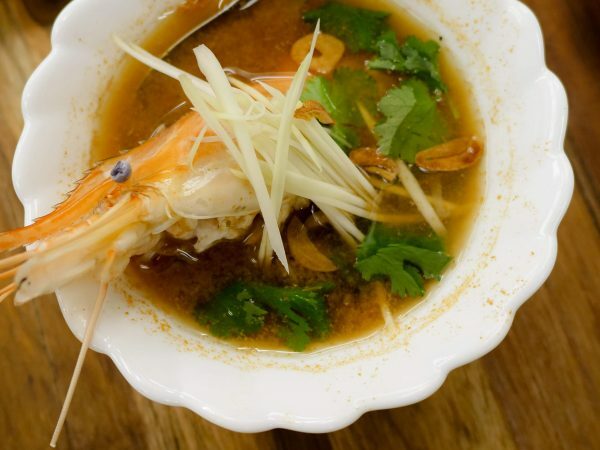 But again, it is their wonderful broth that elevates their boat noodles to a dish of beauty. 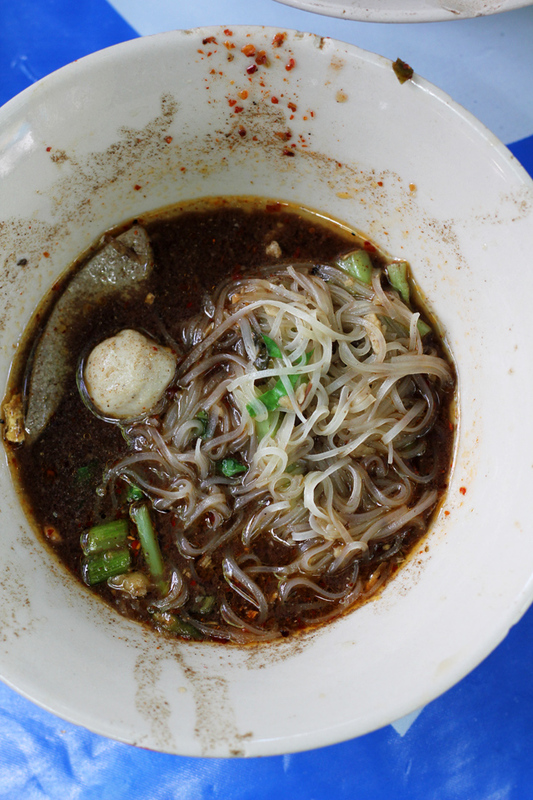 Each and every bite of boat noodles at Doy Kuay Teow Reua (ต้อยก๋วยเตี๋ยวเรือ) is worthy of a celebration. They have fried pork skins and crispy wonton wrappers placed on each table, easily available if you’d like to add them to your noodles. A few bowls later, I was feeling fantastic and sleepy. They also serve moo satay (หมูสะเต๊ะ) at the same restaurant, which appeared to be really good too, perhaps very good because when I went to order them, they had just sold their last order. So better luck next time. Pork satay and boat noodles… quite a wonderful combination! 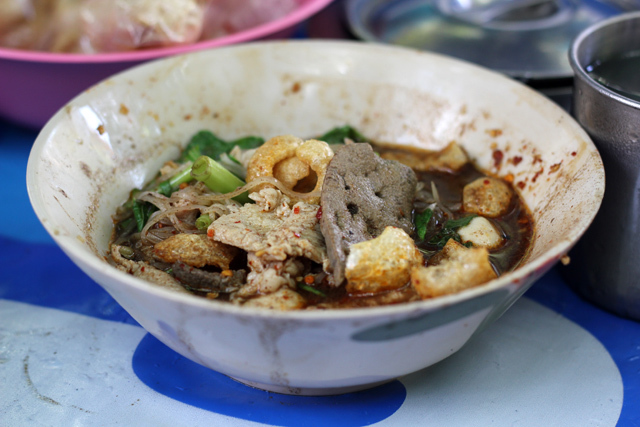 If you’re crazy about boat noodles, you’re going to marvel at the noodles served at Doy Kuay Teow Reua (ต้อยก๋วยเตี๋ยวเรือ). They will ignite your taste buds and you’ll probably have to tie yourself down to not continually eat forever. Located next to the canal and behind a temple, the ambiance is quiet and relaxing, making for the perfect boat noodle dining atmosphere. The closest BTS station is Victory Monument, and once you’re on the skywalk facing the monument you need to hang a left on Ratchawithi, cross the street, walk down the sidewalk (you’ll pass Tops Supermarket), until you reach Soi 18. Walk down Soi 18 about 100 meters and you’ll come to a temple. 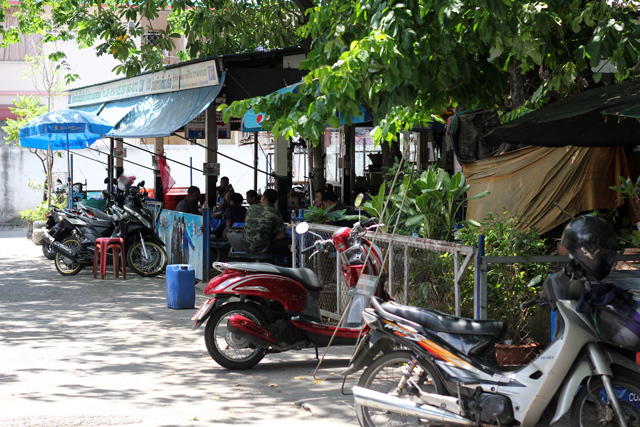 Walk around the temple to the backside and you’ll discover the hidden boat noodle restaurant. 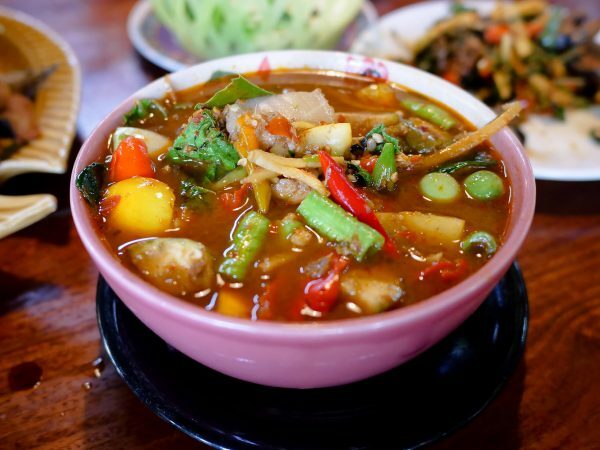 Hi I will be bringing my children to Bangkok and we would like to try out the boat noodle.My concern is the broth spicy?Both my children can’t handle spicy food. Just been here for afternoon food and each of us had 4 bowls. They were so good. Thanks for the recommendation. I was in Bangkok last week and tried these boat noodles. It was amazing! The best meal of the whole trip! (And we had a lot of good food). You have to have them together with the fresh sugar cane juice. That combo was just so good! And the beef noodle bowls were the best. 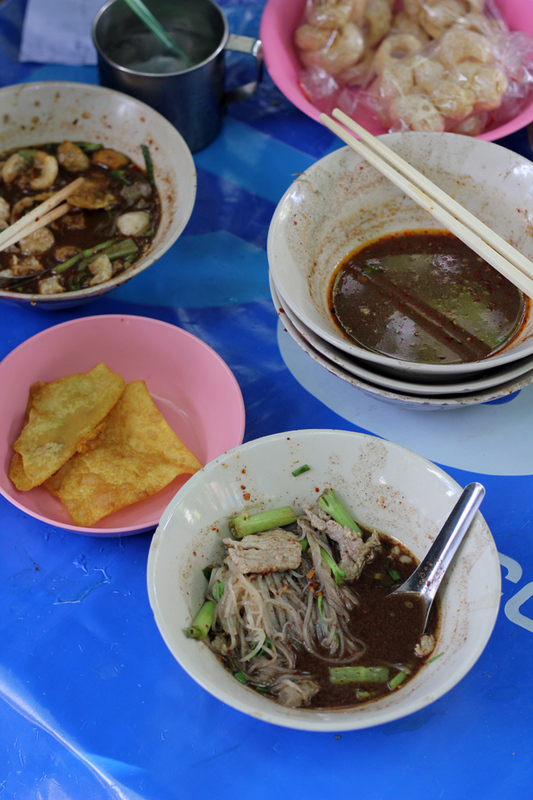 Just polished off our boat noodles! Great recommendation and I especially loved the little coconut desserts. Will be heading back for a few more bowls before we leave Bangkok! I traveled from Australia to try this place and it was worth the trek. This is a great recommendation Mark as the broth is something else! Awesome to hear that Khoi, glad you enjoyed it. Great to hear that Andrew! Hello Mark, do they serve yen ta fo there? Wife and I Just went there to eat boat noodles. Delicious. Hey Jinsuk, great to hear that, glad you enjoyed it. love your videos. how and where do i learn to make my own boat noodle? i live abroad, would love to cook this for my family. 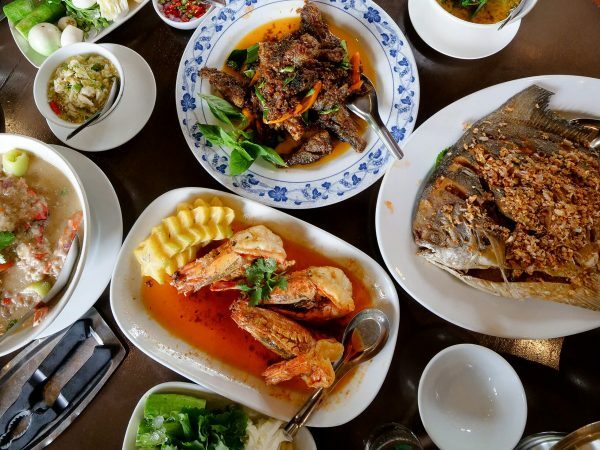 would appreciate it if you could recommend where can we learn to cook in Bangkok. Hey Bona, good to hear from you, thank you for watching. That’s a good question, I actually don’t know how to make it either and I don’t know of any cooking classes that teach it. But I’m planning to learn how to make it and as soon as I do, I’ll make a recipe and post it here. Sorry I don’t know yet. Do you come back to Thailand often? Pailin from Hot-thai-kitchen.com has a great tutorial. As a boat noodle lover, these really were quite good, and a nice environment as well next to the Wat. Thanks for the reco! Cool, glad you enjoyed it! Do you know of any good beef noodle soup places. There used to be a great one behind the temple near Khao San road about 10 years ago but I’ve no idea if it’s still there. Mark, thanks for the great review! How easy is it to place an order in english? Is beef kuay teow reua also available? Hey Kee, yes I believe beef is also available. There’s not menu, you just order, “moo” for pork or “neua” for beef. Enjoy! 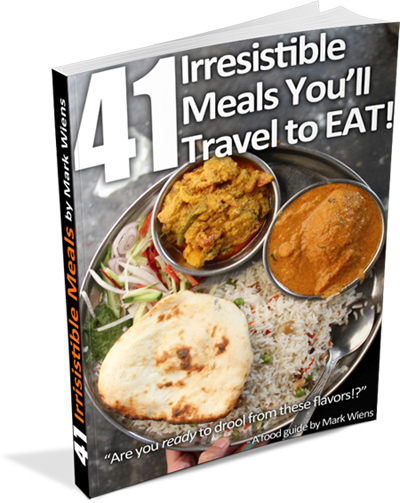 Mark, have you explored Soi Rangnam? It’s near BTS Victory Monument Station. There, you can walk to find food street vendor (I like Gai Tod Hatyai and Moo Ping Nomsod there) but there are many shop and restaurant you can write about. Hey, yes, I used to live in that area and tried many of the restaurants – very good. I really like Rod Ded Isaan restaurant! OMG I was in Thailand in December and couldn’t find any great boat noodles. I’m obsessed. I can’t wait to go back and go to these places! Thanks for the guide. I have been going to this place since I was a student…more than 20 years now. Still take friends from overseas there now and then. Good to hear that Nok, this place serves some amazing noodles! The longer I live in Thailand, the more obsessed I become with Kuay Teow. I’ve done the Victory Monument spots while visiting Bangkok, but this place looks good. Hey Alex, if you like those boat noodles at Victory Monument boat noodle alley, you’re going to love these!